Update 2/5: We are happy to report that Spanky went to live with Anne! The family is relieved, knowing that he's in good hands. Spanky was a kitten when Anne adopted him from a rescue, 7 years ago. Now, Spanky needs to be rescued again as Anne's health prevents her from caring for him. 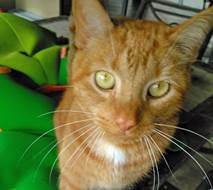 Spanky is friendly and affectionate, but as with many felines, he prefers to be the initiator. He is good with other cats, but his dog interactions are unknown. He has always been a healthy cat, with a local vet in place. If you are interested in adopting Spanky, please contact Colette at 239-985-7728.